Thalassemias are inherited blood disorders. If you have one, your body makes fewer healthy red blood cells and less hemoglobin. Hemoglobin is a protein that carries oxygen to the body. That leads to anemia. Thalassemias occur most often among people of Italian, Greek, Middle Eastern, Southern Asian, and African descent. Thalassemias can be mild or severe. Some people have no symptoms or mild anemia. The most common severe type in the United States is called Cooley's anemia. It usually appears during the first two years of life. People with it may have severe anemia, slowed growth and delayed puberty, and problems with the spleen, liver, heart, or bones. Doctors diagnose thalassemias using blood tests. Treatments include blood transfusions and treatment to remove excess iron from the body. If you have mild symptoms or no symptoms, you may not need treatment. In some severe cases, you may need a bone marrow transplant. 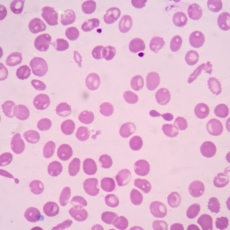 Article: Inherited hemolytic anemia: a possessive beginner's guide.